Despite the cold weather and the gloomy economy, December seems to have brought with it a certain golden glow. Harrods Christmas lights gleam in the dark Knightsbridge night. Their window displaying the iconic Chanel No 5 perfume is golden and shining. Glittering golden trees flank the front doorway at Harvey Nichols. Even seasonal gift wrapping reflects the gold mood - fashionable baroque style gold and black damask wrapping paper and glossy rosette bow from Paperchase. There is a new festive makeup collection from Chanel for the party season. Collection Eclats du Soir de Chanel combines the shimmer of gold and bronze with soft beige, pinks and dark red shades. For me, the star of the collection is "Harmonie Du Soir", a palette of four beautiful eyeshadows; Bronze Gold, Plum Red, Smokey Taupe and Pink. 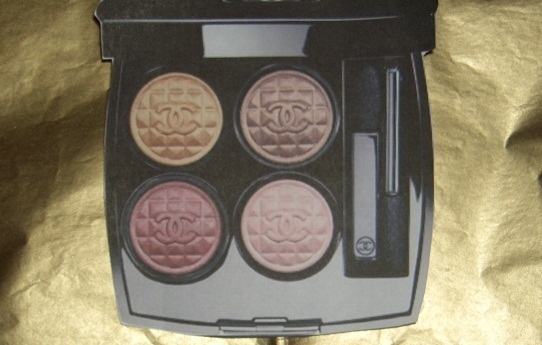 Each eyeshadow resembles a Chanel button, quilted and stamped with a double "c". Some have been celebrating Chanukah, some are looking forward to Christmas and most are welcoming the forthcoming holiday season. Seasonal greetings and happy holidays to everybody.